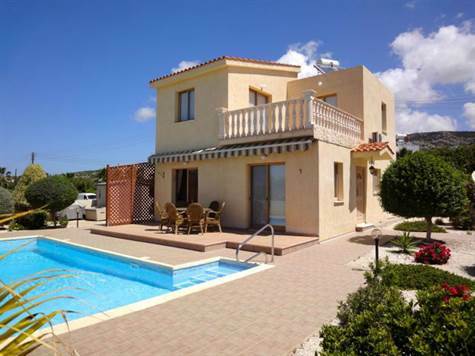 Sea Caves, Paphos - This immaculately presented 3 bedroom detached villa is located in a quiet cul-de-sac between the sought after areas of Coral Bay and Sea Caves. The property is in excellent condition and finished to a high standard throughout. On the ground floor is an L-shaped living room with spacious lounge and dining area. An attractive archway and breakfast bar nicely separates the dining area from the impressive Italian fitted kitchen. The kitchen with black granite worktops is well designed with double oven, dishwasher, fridge/freezer, electric hob and stainless steel cooker hood. The washing machine and an additional fridge is housed in a separate utility room. From the living room is a hallway leading to the a double size bedroom with patio doors opening on to a private veranda area. Next to this is a shower room and the staircase leading to the first floor. Here there are a further two double size bedrooms, both with en-suite facilities and access to a large balcony with stone balustrade and good sea views. A second good size balcony with lovely views of the rural area and mountains to the rear of the property, is accessed directly from the landing. Moving downstairs, there is easy access to the pool terrace and gardens, with two sets of patio windows in the living room and a door to the side. The plot is well designed with attractive landscaped gardens surrounding and a side driveway with plenty of space for parking.